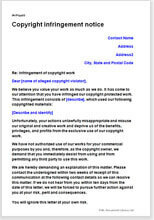 This is a simple and courteous letter to warn an alleged copyright violator before initiating a court action for damages that might have been caused. In the event the violator is not a chronic defaulter and has done something without any ulterior intentions, this letter will help resolve the matter without court intervention. Suitable for simple and complicated situations. Identity and contact information of the sender of the communication.